So let’s credit this season’s abundance on the weather. Rainfall was regular and sufficient up until August. Those periods of rain punctuated longer periods of intense sunlight in which plants no doubt reveled. Temperatures also get credit. Very hot weather interfered with corn and pepper pollination last year; not so this year. Temperatures were neither too hot nor too cool all season long. Okra was the only vegetable complaining this year. Torrid weather is needed to keep those pods coming on. This summer, pods appeared on okra plants whenever the mercury soared, then the plants just sat, doing nothing, waiting out periods of cooler temperatures. It’s time to render praise to a vegetable that has tasted and looked fresh and good all season long, every season, irrespective of the weather. That vegetable is mizuna, sometimes known as mustard cabbage or kaai ts’oi, or botanically as Brassica juncea or Brassica rapa nipponosica. I sowed mizuna seeds along with lettuce and arugula seeds in the garden in April in a bed slated for corn planting later in June. Mizuna, lettuce, and arugula all provide greenery for early salads, enjoy cool spring weather, and are in and out of the garden quickly enough to be out of the way for a later crop such as corn. I pulled out these plants just before sowing corn — most of them. Arugula was anyway going to seed and the lettuce was soon to take a step in that direction. Mizuna, though, was still looking fresh and green so I left it in place. As corn stalks reached skyward, mizuna kept its fresh appearance and tenderness of spring. That corn bed is now ready for harvest and mizuna is still tender and tasty. Most kinds of mustard greens would have tough leaves and have gone to seed months ago. After the ears of corn are harvested, my plan is to dig out the corn plants, carry them off to the compost, and leave mizuna to carry on until really frigid weather turns its leaves to mush. Mizuna flavor is mustardy, but only mildly so. Taste it and it seems to ooze vitamins and minerals, borne out by analyses showing it to be especially rich in pro-vitamin A and calcium. Did this season’s weather make for better-tasting tomatoes? Perhaps. Perhaps not. The main influences on tomato flavor are the amount of sunlight, the amount of water plants take up, probably plant nutrition, especially with respect to potassium and phosphorus, and — most importantly — the variety. I’m happy with the taste of this season’s tomatoes but was eagerly awaiting ripening of the variety Gardener’s Delight. I grew Gardener’s Delight about 40 years ago and thought it was the best-tasting cherry tomato in the world. After not growing it for decades (other varieties got my attention), I grew it again last year, only to be disappointed in the flavor. That led me to wonder whether the apparent change in flavor was due to Fedco Seeds, the company from which I purchased the seeds, getting sloppy with their seed-saving, differing growing conditions (Wisconsin vs. New York), or whether I had become more discriminating in tasting my tomatoes. nd Thompson & Morgan (www.thompson-morgan.com). The latter is a British seed company, the source of the seeds I planted 40 years ago. Last week, to a drum roll (in my head), I tasted Gardener’s Delight tomatoes from each of the three sources. They all tasted the same — and not very good. Fedco Seeds was exonerated. Ruling out growing conditions since all my other tomato varieties taste as good as in seasons past, the verdict lies in my taste buds. Not that my taste buds themselves have become more discriminating. 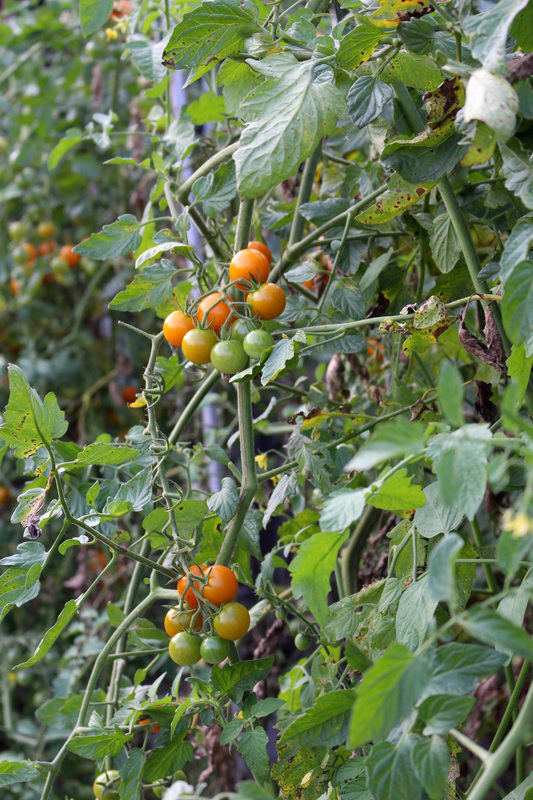 Instead, cherry tomato varieties have greatly improve over the past 40 years. More specifically, the variety Sun Gold came on the scene more than 20 years ago (also introduced by Thompson & Morgan and now widely available). I think I speak for everyone in stating that Sun Gold is the best tasting cherry tomato ever. Gardener’s Delight may have been good in its day but it has been easily eclipsed by Sun Gold. Whether the growing season is cloudy or sunny, or warm or cool (within reason), Sun Gold always offers a bounty of persimmon orange, delectable, sweet-tart tomatoes with bold flavor. This entry was posted in Gardening, Planning, Soil, Vegetables and tagged Gardener's Delight, green thumb, Mizuna, mustard, Sungold, tomato, weather. Bookmark the permalink. Trackbacks are closed, but you can post a comment. Well stated. I was thinking exactly the same thing, regarding my garden. Amazing… except for the figs. Just not ripening. 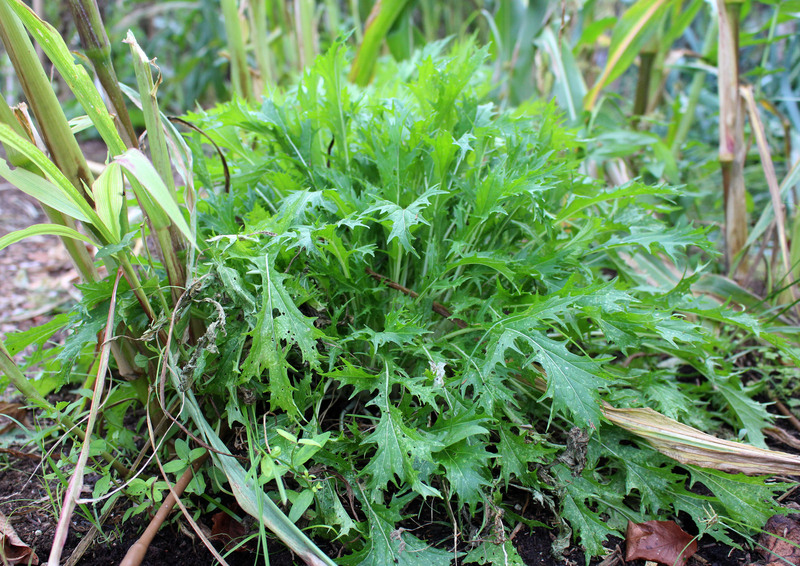 Have you tried Scarlet frills Mizuna? So pretty coming out of a bed of green anything, in our case, reseeded wild arugula. I’ll have to try Scarlet Frills. As far as figs, many people have noted the late-ripening or “not yet ripening” of theirs. The bulk of my figs come from my cool (temperature, in winter, minimum 35°) greenhouse, with the plants growing right in the ground. The first fruits started ripening in July, the variety San Piero, my most productive. Sungold is great, but Jasper has earned a place beside Sungold. Jasper is both sweet and acid, but not fruity like Sungold. Unfortunately Jasper cracks easily, often while being plucked from the vine so it must be handled gently. I might have to try a Jasper plant next year. Just one, though, because I’m very reluctant to try new varieties. I’ve done that too many times only to find the fruits did not taste as good as my standby’s. Sungold! I will grow Sungold every year although I did taste a black cherry tomato to rival. I think I will grow those, too. I am happy for your bounty! We had our shortest growing season here in Jefferson County NY in the last 25 years – just 135 days. My cherry tomatoes are finished I am sad to say, but of course, I froze my favorite “summer in a jar” recipe so I have back up. So what’s the name of the “black cherry tomato” that you grew? My Dad planted sun-gold about 20 years ago — it was then, and remains, the best tomato available. A new slicing tomato that is now one of my favs is Solar Flair from Wild Boar – but I see not offered at momment? Here’s what I previously blogged about tomato grafting . . . http://www.leereich.com/2014/02/graft-good-kind.html. As an addendum, mu friend Sara gave me grafted tomato plant she made this year. It did not better than any of the others, no surprise since the main pest problems here are leaf diseases not soil or root diseases.